Water is often the main attraction in the summer as temperatures rise and birds become both thirsty and overheated. In hot weather, fresh water helps birds keep hydrated, keep their body temperature down and keeps their feathers in optimum condition. 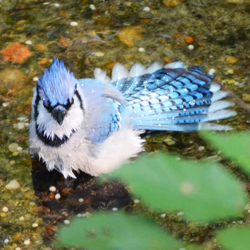 Often clean, safe-to-visit water isn’t readily available, so leaving fresh water in a shallow basin so smaller birds can easily drink and bathe is a welcome sight and will be frequently visited. Many of the decorative baths are too deep, but you can put rocks in the bottom to give smaller birds a better platform. You can get as fancy as you want including attaching misters that are extremely popular when temperatures get really hot. Especially in hot weather its important to make sure the bath is cleaned regularly so the birds have uncontaminated water. Putting water out in a spot where birds can easily get cover from predators, such as near a thicket or bushes that give them a quick place to dive into is also a good idea. 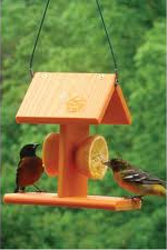 With a variety of birds visiting feeders in the summer, you can be specific about the kinds of birds you want to attract with the type of food you leave out. If you like finches and want them to visit, try using special feeders designed for them. These feeders have a small opening which dispenses nyger (also called thistle), a tiny black seed. Only finches have bills small enough to access these seeds, and an added bonus is that squirrels probably wont wreak havoc in your yard trying to get at it as they typically don’t like this seed. If you love Orioles, you might be pleased to know that not only are they orange….they love eating oranges! An easy way to attract orioles is to cut an orange in half and stick a branch through the middle. You can also buy a feeding platform for this as well – or you can build one yourself with these simple plans. A small cup with jelly in it is also attractive to orioles. Eventually ants will find the cup, but don’t worry. The ants themselves will attract insectivores, such as woodpeckers. 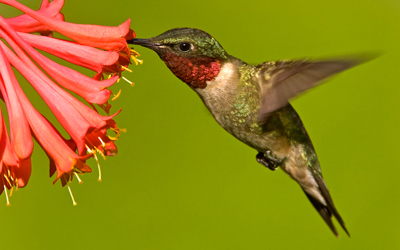 If Hummingbirds are on your list of birds to attract, their needs are a little more complicated but not too much work. They love nectar, and you can give it to them in two basic ways — by using a hummingbird feeder or providing nectar producing plants. Hummingbird feeders come in a variety of shapes and prices, but they all dispense sugar water out of holes the hummingbirds visit. You can either make your own sugar water (4 parts water to one part sugar, boil for 5 minutes, and be sure to let it cool before putting it out) or buy it from a bird feed store. No need to add any food coloring if you make your own. Make sure you change the water every 3 or 4 days (sooner if the weather is very hot). If you don’t change the water, the sugar can ferment and actually harm the hummingbirds. If you like hummers, consider planting wildflowers. Most gardening stores have plants and seeds that are labeled attractive to hummingbirds. The best flowers are tube-shaped and bright red. Favorite flowers may be more effective at attracting hummingbirds than feeders, but a combination of both is a great idea! Whichever birds you love watching in your backyard, summer is a wonderful time to see them up close. So, try a variety of different seeds and water sources and see who stops by for a visit. And don’t forget to have your binoculars and camera handy nearby for the perfect view. Want to know which birds are visiting your feeders? Our Wild About Birds! iPhone/iPad app can help you find out.